The new Brahms-Glanert: Four Serious Songs, etc. recording is now released. 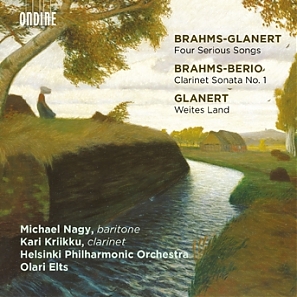 The disc, by Ondine, features Brahms-Glanert: Four Preludes and Serious Songs, Detlev Glanert: Distant Land (Music with Brahms for Orchestra) and Brahms-Berio: Op. 120 No. 1 (Clarinet Sonata No. 1 for clarinet and orchestra by Luciano Berio). It was a pleasure to record these pieces with the wonderful Helsinki Philharmonic Orchestra, baritone Michael Nagy and clarinettist Kari Kriikku. The Guardian newspaper gave this recording a 5 star review and commented: 'Conducted by Olari Elts, the Helsinki Philharmonic packs a sense of epic scale into its 11 minutes [of Glanert's Distant Land]'. Find out more / buy the CD here.